In the late '90s there was a perception of DJs as vinyl-hugging technophobes who relied on a 20-year-old turntable design and swore by headphones launched in the '80s. It used to be an utterly fair stereotype — after having reviewed the very first Traktor back when it ploughed into the scene, trying to convince my clubland chums that it was “the future” I was met with pity and derision. Of course, things have changed now. Every DJ in the scene can’t wait to check out the latest bit of kit and technology that shapes how we drop our sets. But when was the last time we saw something really new to challenge the domain of Traktor, Serato, even Mixvibes and the rest? Well, enter Audio Artery and ONE DJ. So what is ONE DJ? Well, Audio Artery are curiously vague in their description, relying on a string of bold claims about remixing on-the-fly, unlocking creative potential and lots of other marketing spiel. So here's DJ Mag's take. ONE DJ is just like every other bit of DJing software, except that DJs can construct a virtual modular set-up and, critically, each deck can also function as an audio sequencer. Let's look at those two facts in order. 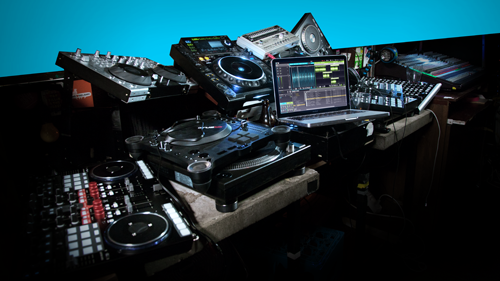 First, DJs are able to construct their own custom set-up. Any number of decks (from one to more than DJs could ever use), any number of effects modules, any number of mixers, any number of browsers, the routing of all of the modules and the placement of all the modules on screen, with all modules in a given signal path colour-coded (including deck waveforms). Take a deep breath… whether DJs need three mixers or five browsers is debatable, but we love the open-ended design. All cool so far, but what’s so radical here? Let's look at that second feature, that really starts to mix things up. The decks can be used like arrange pages, as in Ableton Live. In ONE they are called 'timelines' and they let the DJ/performer lay out as many audio files as they want in one view. A simple example might be placing an acapella and an instrumental together side-by-side. Of course DJs can do this with four decks, but by placing it all in the same deck ‘window’ users can trigger them as one, on a whim, mid-set. Imagine those times thinking, “Wow, that would make a great mash-up” mid-set, making a mental note to knock it up in Live for that next gig? Well, it can now be done pretty much on-the-fly. ONE is flexible enough to enable this. Or to take another example, let's say a track is playing and the first floaty breakdown has gone down like a lead balloon, but the groove is rocking. Simply jump ahead in the track's timeline, go into 'edit' mode, and just snip out the part that is not needed, while the track is still playing. These are just two examples of how ONE can be innovative. 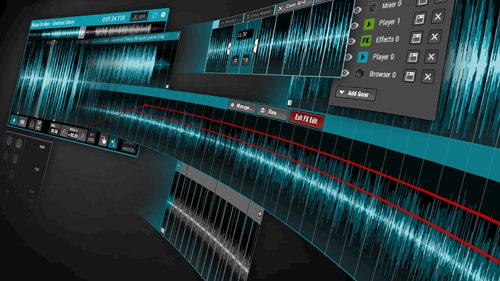 Effectively ONE is the merging of a sequencer and DJ software in ‘one’ package. The creative potential is really exciting and backed up by the same z-plane warping technology as found in Live (and numerous other DJing applications) allowing auto-time-stretching, beat matching and even complex beat grid editing. There are a number of modes that really add to the creative feel ONE is out to achieve. Advanced grid editing is pretty flexible — the grid can be easily set even when the tempo of a track changes. Just select the area and enable adjustments from the drop down menu. This is especially helpful for merging audio with different bpms. Live editing is another handy feature. When in the edit mode, DJs can move around the track without affecting the play position. This allows users to manipulate future events of the track while the song is still playing in the same player window. Not only can users get deep down and dirty when it comes to mixing up their audio tracks, ONE DJ also allows DJs to create hot cues or position markers anywhere in the audio timeline. This means that multiple tracks can be cut up and hot cues can be added anywhere within the track or mix. ONE DJ's modular approach and flexible audio routing system means that there is freedom to place effects and various modules anywhere in the audio chain. This means that effects can be placed between the virtual deck players and mixer, or used in the master section to change the overall sound of the set-up. This approach mirrors how it would be done if DJs were creating a track in a conventional DAW, and is especially useful for broadcast and podcast mixes. Whilst ONE DJ is a clever bit of software with a vast amount of possibilities it is still very much a work in progress and at the moment can't quite live up to its full potential, for a number of reasons. Timeline is an awesome feature and DJ Mag has really enjoyed playing with it, but with only basic EQ and level automation and control for the individual tracks within a timeline, users are really restricted in what they can do. Also, the lack of an 'undo' may soon drive many crazy. In their defence, some of these issues will be resolved in the forthcoming update but there are other things that need to be addressed. No third-party plug-in support as yet, some questionable button placements (effect 'bypass' next to effect 'remove') and other little design quirks. One gripe is that in timeline/arrange mode, audio files can be placed on top of one another and both will play, which can lead to some embarrassing results if DJs have left a small snippet of audio in their timeline and forgotten about it. These irritations pretty much encapsulate DJ Mag's impression of ONE DJ as a work-in-progress. It also illustrates why we like it, and are genuinely looking forward to seeing it go through its various progressions and developments. As they say Rome wasn’t built in a day and if you look back at the very first version of Ableton it was nowhere near as refined as what we have today. For every issue we encountered and challenged, the developers were either receptive or actively on the ball already to get a fix in place. Possibly the single most important feature of live performance software is stability. DJ Mag tried ONE DJ with two kinds of Mac (an older Core Duo 2 Macbook Pro and a newer i5 model) and found it largely to be very stable, with one functional exception: when switching from a four-deck set-up preset to a two-deck set-up preset during playback, we experienced two crashes. And with no 'last set-up' back-up, everything DJ Mag had been playing (timeline layouts, loaded tracks etc) was lost — had we been live we would have had to start loading tracks again from scratch before the crowd heard music again. All this said, if you read the ONE DJ site carefully they only recommend use with newer Macs and i-series processors, and we experienced the crashes on the Core Duo 2. And as DJ Mag didn’t use a PC for testing, we can’t comment on how stable it is on this platform, but doubt there are many major issues if any at all. ONE has a MIDI-learn feature that's easy to use and it supports the HID protocol, so compatible controllers can offer super-low latency, but at the moment the amount of controllers that are supported as standard is sparse. There will be templates released very soon for the likes of Vestax, Hercules, Numark and companies like that, but some of the major players are currently missing. This is a tricky area to approach as ONE is a modular design and effectively will be used differently by different people — this means making standard templates is tricky, as how the software is set up depends on how DJs use their controllers. We think they should have made standard basic mappings for every major controller before launch. Maybe it's something that a DJ would want to explore for themselves. With this ethos it is easy to build an impressive hardware controller set-up using various manufacturers' pieces of kit to control the various elements of the ONE. We’ve got used to everything being handed to us on a plate. The gripes mentioned above will only affect the DJs who don’t want to get their hands dirty, other jocks may just love getting deep into the whole process of creating their own layout and mappings and a unique DJ and live performance set-up that will cater for their individual needs. And so, all in all, ONE DJ feels like a version one, but Audio Artery know it, and are actively developing it. Critically, though, what is here is great, and the fact that they hold their hands up about things that could be improved and have assured DJ Mag that they're on the case is surprisingly rare. The ONE could have an amazing future and after all Ableton Live has been around for over 10 years — imagine what ONE will become in another 10 years? At just £45 ONE DJ is cheap, but doesn't feel budget, and it is really worth checking out. There is great potential here and the more of us that give it a try, the more impetus (and resources) they will have to improve it.